Do you want to add different product options that affect the pricing? When you sell a product, you may want the customer to be able to select different product options on your order form that will affect their total price. In this article, we’ll show you how to add product options that change the price for that product. WPForms comes with a variety of different payment fields that enable you to customize the way you sell your products. You can allow your users to choose different product options that change the total price of your product. For instance, if you’re selling a printed t-shirt, and want the user to be able to select quantity, size, style (t-shirt or sweatshirt) and more that affects the pricing, you can easily do that with payment fields like multiple items or dropdown items. Adding product options to your order form enables your customers to customize the order to their liking with ease. Let’s take a look at a step-by-step guide to add product options that change the total price. The first thing you need to do is to install and activate the WPForms plugin on your site. To get started, read how to install a WordPress plugin. Then, you’ll have to get an order form created. You can read our tutorial on how to create an order form. Now that an order form is created, let’s add multiple products and allow users to customize the order to their liking. For this, we’ll be using Dropdown Items field under the Payment Fields section. For the sake of this example, let’s add two products: Item #1 and Item #2 and allow users to select the quantity. 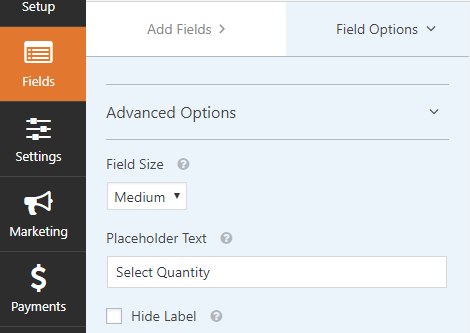 To customize a certain field, click on the field in your form builder. You can then change the label, items and their prices. Keep in mind that you can add more items if you wish. Be sure to set the right price for the items you add. Next, scroll down the Field Options to change the placeholder text. You can find Placeholder Text under Advanced Options. You can repeat the above steps for Item #2 as well. 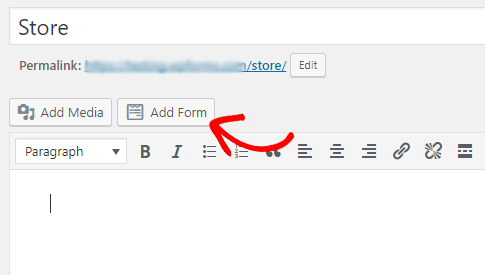 To publish the form you just created, you can go to your page editor. Then click Add Form button above the text editor. You’ll now see a modal popup where you can choose the right form you want to publish. Choose the form and click Add Form. Finally, you can preview your form before publishing it on a live page. We hope this guide helped to add product options that change the total price. If you enjoyed this article, you might also want to read how to sell digital products on your site. How do i change the currency from $ to uk £? I am wondering if there is any way to use WPForms in conjunction with WooCommerce. For example, if I wanted to add my name to a shirt. Could I use WPForms to add text input fields to my WooCommerce site? Hi Heather – We don’t currently have any integration with WooCommerce. I’ve noted that on our feature request list, though, for consideration down the road. Thanks! What methods of payment will this form take? Do they need to have a PayPal account to use it or can they checkout with credit card as a guest? Sure so if you’re using our PayPal addon, users should be able to checkout without logging into a PayPal account. However, you’ll need to make sure that your PayPal account is set to be a business account (not a personal account) for this option to appear for your users. This business/personal option can be a bit tricky to find, so I’ll share some extra details. Here’s the PayPal page I used to find the setting for this, and here’s a screenshot of the specific instructions from that page that I was able to use to find the correct setting. Is there a way to limit the quantities sold using WP Forms? It looks like I can only set currency to one specific type. How do I set it up to be able to do US Dollar AND Canadian Dollar? You’re correct, and currently only a single currency option can be selected. I can understand that more options would be useful in some situations, though, and I’ve noted this on our feature request list for possible consideration. Is there a way to add quantities to the Payment Fields/multiple items? Also, is there a way to select multiple items? Now its limited to one item per field. Can I get the form to total up a dollar amount without adding a Payment Integration. We need to charge inter-departmentally for items, but it is done via department accounting, not actually credit cards, ets. Is there a way for a customer to manually input the quantity they desire (not select it from a dropdown), and then the total is updated (multiplied) by that amount? We currently don’t have a way to run calculations for product quantities the way you described. A possible workaround for this would be to create a Dropdown Items field for each product and fill in the dropdown options with various quantities and associated prices. This would allow you to offer both multiple products and various quantities of each of those products. 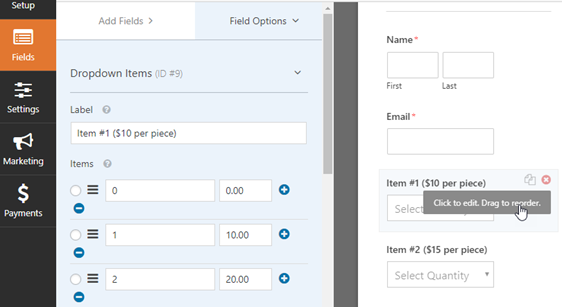 We currently don’t have a coupon field available but you can workaround this by adding in two Multiple Items fields — one with normal pricing and one with discounted pricing. You can also added a Single Line Text field to accept a coupon code. The last step was to create conditionals for each of the item fields. To do this, click on one of those fields and open the Field Options screen. From there, open the Conditionals section and check ‘Enable Conditional Logic’. For the full price items, the logic should resemble this screenshot. This tells this field to be hidden if the correct coupon code is entered. The discounted item’s conditional logic should be set to display when that same ‘coupon code’ is entered. It would be nice to have a way to multiply the price of a product by the value of another field. The order quantity feature isn’t working for me. How do I create the option to order a quantity of more than 1 item at a time and have the purchase price properly calculated for multiple items? I was wondering if you could add Japanese yen in the currency list? In case it helps, here’s our tutorial with the most common ways to add custom code like this.